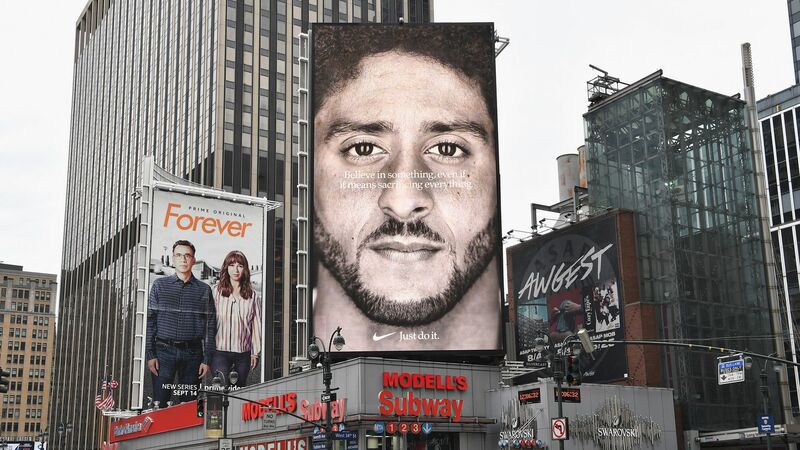 A Nike ad featuring Colin Kaepernick in New York City. Photo: Angela Weiss/AFP/Getty Images. Nike’s stock leveled out Monday after the company's bumpy week of mixed consumer and shareholder reviews due to its decision to feature former 49ers quarterback Colin Kaepernick in its 30th anniversary "Just Do It" campaign. Why it matters: Polling shows consumers have favored brands for picking sides on social issues in the past, but the Kaepernick campaign hit a particularly raw nerve in today's culture wars as driven by President Trump. Nike took a dip in favorability — shoes were burned, swooshes were defaced and Trump tweeted Nike was "getting absolutely killed" from the decision — all as Nike's online sales trended upward. Between the Sunday of Labor Day weekend and Wednesday, Nike's sales rose 31%, according Edison Trends, a digital-commerce researcher. In the same period last year, product orders fell 2%. Nike pulls in $43 million worth of free media exposure despite public backlash, according to Apex Marketing, Bloomberg reports. After a 3% stock dip from the initial news, Nike stock regained 93% of the decline, per MarketWatch. Nearly 60% thought brands should take a position on controversial issues no matter what, rising to 83% when combined with those who wanted companies to take a stance only if it related to their products or services, according to a report from eMarketer. The other side: A Morning Consult poll released right after the campaign launched showed Nike’s brand favorability dropped 34 points from a net +69 favorable impression (76% favorable, 7% unfavorable) among consumers to a net +35 favorable impression (60% favorable, 24% unfavorable), per Axios' Sara Fischer.